I enjoy seeing our patients’ when they get their braces off. There is so much joy on each person’s face and they are so happy with all they have accomplished! 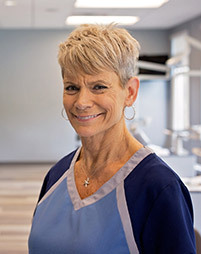 I started working in the field in 1985 and am a graduate of the Wayne Community College Dental Assisting Program. I welcome new patients and their families to our practice, guide them through their initial visit, and review financials with them. I also set appointments and, when needed, help in the clinic. My husband Jeff and I have been married for 30 years and have two daughters as well as two cats. We enjoy traveling, especially to the beach, and I like watching the History Channel, exploring flea markets, DIY projects, reading mystery books, and gardening. I enjoy cheering for the Carolina Hurricanes and Mudcats, too! I like getting to know all of our patients and watching their smiles transform. It is amazing to watch everyone becoming happier and more confident at each visit! I attended two years of school for dental assisting and started in this field in 2017. Working at the front desk I schedule appointments and confirm them, too. I also verify insurance benefits. Born in Paterson, NJ, I was raised in Raleigh, NC. When not at work, I’m usually watching movies with friends or home and watching Netflix. I enjoy getting to know each patient during treatment and watching as their self-esteem and confidence grows! 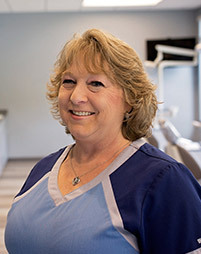 I started working in the field in 1982 and have a degree in dental assisting. In addition to assisting Dr. McClure with different orthodontic procedures, I also handle our inventory processes and lab work. After 36 years of working in the dental field – 20 of those at this office – I plan to “retire” and move to the beach at the end of 2018. I have been honored to work with many awesome people who have become my friends, and with Dr. McClure, who is the best orthodontist. I have come to know and care for many patients who’ve become my friends of the years: I will miss everyone but also look forward to relaxing and enjoying life to the fullest. I like establishing relationships with our patients and seeing their smiles, and personalities, transform during treatment! I started in the field in 2001. Working in the clinic, I provide chairside assistance to Dr. McClure as he crafts great smiles. I also offer patient care, teach people about oral hygiene, and encourage everyone to keep up with their homecare. I moved to North Carolina from Virginia with my fiancé, Shane, and our German Sheppard, Gunnar. We love all this state offers, from the mountains to the ocean! I especially love the beach and being outside. My favorite sport is hockey: I love to go to games and support the Washington Capitals. I’m very excited to be planning my Caribbean destination wedding for 2019! I like getting to know our patients and watching their transformations. Each person becomes more comfortable with their appearance and, in the process, becomes happier and more confident. Those finished smiles are the best! 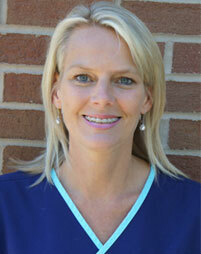 I have worked in the dental field since 1993 and have more than 20 years of experience in orthodontics. I welcome new patients and parents, walk families through financial and treatment contracts, and coordinate the insurance billing. I also handle all practice management tasks, keeping everything running smoothly so our patients have the best experience. Outside of work, my priority is family time. I’m married and have three daughters, Raigan, Morgan, and Taylor, as well as a granddaughter, Kinsley, and a grandson, Jon Henry. My husband Mike and I enjoy traveling in our RV and participating in church activities. I love working with our patients from the start of treatment to the end when they have achieved their best smiles. I enjoy seeing each person’s changes and knowing that, for some people, we have completely transformed their lives! 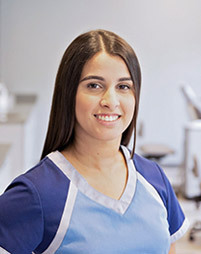 I attended a six-month dental assisting program in Syracuse, NY, completed an internship in a pediatric dental office, and started working in the field in 2011. In addition to assisting Dr. McClure with different procedures, I work directly with patients, sterilize instruments, and perform lab work. In 2017, my husband and I moved to North Carolina from Syracuse for his new job. We love it here! We are outdoors people and this weather is perfect for being outside most of the year. Now that we have found our forever home, we have a nice big yard that our dog, Lacy, loves. With fall approaching, we’re excited to watch our favorite football team, the 49’ers, play, followed by our love for the Syracuse Orange Men basketball team! I enjoy watching our patients grow, change, and gain so much self-confidence from their new smile! Since we see our patients every six to eight weeks, we have time to build real relationships that often become friendships, and know a friend loves their smile is wonderful! 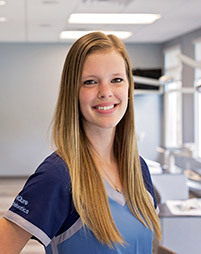 I started in the field in 2015, after attending dental assisting school. When needed, I help our assistants in the clinic, but most of the time I’m in our front office. I welcome patients, schedule and confirm appointments, answer the phones, and review contracts with patients and parents. Born in Indiana and mainly raised in Apex, NC, when not working, I’m usually with my husband Adam and our young boy, Dominik. We have two cats and a Basenji, an African hunting dog. I love being outside, exploring the beaches and mountains of North Carolina, and traveling. My family loves the fall because of football: Go Clemson Tigers! Go Indianapolis Colts! I enjoy creating relationships with our patients and their families and watching each person’s beautiful smile transform! I have a BS in Nutrition and Dietetics from the University of Montevallo and have worked in the orthodontics field since 2014. I greet patients and their families, answer the phone, verify insurance, and schedule visits. I also review financials with parents and patients. My husband Vance and I moved to North Carolina from Atlanta, GA, in February 2018, with our two dachshunds, Cooper and Millie. We love to travel and love going to our family lake house in Hayesville, NC, on Lake Chatuge. We love to watch and cheer for Alabama, too: Roll Tide! Each day brings the excitement of getting meet new patients and being able to make them feel at ease and comfortable. Working with Dr. McClure and the girls is so much fun! They are easy to work with and very supportive. 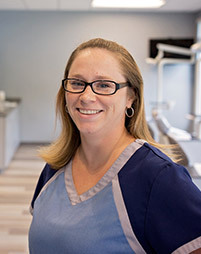 I graduated from Sunrise School of Dental Assisting in Raleigh in 2015 and joined the McClure team in 2018. 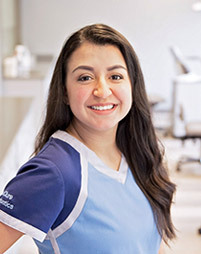 I assist Dr. McClure with patients’ orthodontic adjustments, sterilization, and lab duties—anything that has to do with our patients’ smiles! Outside of work, I like to spend my free time crafting with my daughters, Sophia and MaKenzie. We paint, sculpt, and read fun Dr. Seuss books. We also love going hiking in the mountains. When I get some quiet time, I love reading. 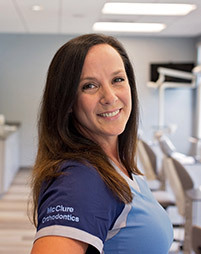 The best part of working at McClure Orthodontics is watching all the patients’ smiles transform throughout their treatment. I look forward to coming into the office every day. Everyone here is so nice! Even though I am a new team member, I already feel like I’m part of the family. 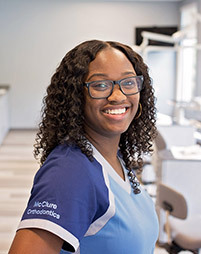 I went to Sunrise School of Dental Assisting in Raleigh in 2016 and joined McClure Orthodontics in 2018. 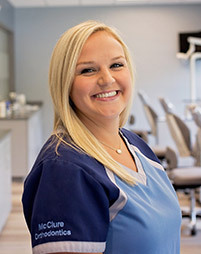 I work with Dr. McClure with our patients’ treatment, make retainers, change wires, and generally make people smile! I was born and raised in Raleigh, NC, the third out of six children. My hobbies include listening to country music and Spanish music, and making origami. The coolest thing I've made is a camera out of a single dollar bill!